“At McDonald’s, we are committed to sharing love and giving back in our local communities and we look forward to bringing people together to enjoy inspirational music while highlighting such a worthy cause like RMHC,” saidWilliam Rhodes, McDonald’s U.S. marketing director. Concerts are free of charge. Fans can visit http://www.365Black.com to obtain tickets. 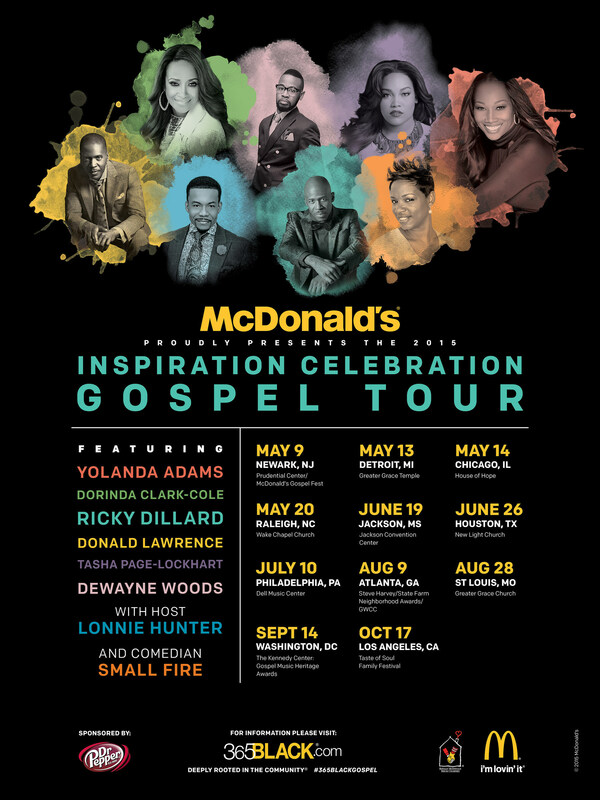 The multi-city tour will make stops in 14 markets, including: Atlanta, Charlotte, Chicago, Detroit, Greensboro, Houston, Indianapolis,Jackson, Los Angeles, Milwaukee, Philadelphia, Raleigh, St. Louis and Washington, D.C.
To learn more about the tour and McDonald’s 365Black initiative, visit http://www.365Black.com. Follow@365Black on Twitter for tour updates and join the conversation at #365BlackGospel.